Ballymena First Aid provides ‘caring first aid delivery’ as well as instructing others in first aid training. Danny McCann is the founder of Ballymena First Aid. He has over 20 years experience of delivering first aid in many situations, having worked in both domestic and non-domestic settings. Danny has a real passion for providing an extremely high level of first aid himself but also to pass on his knowledge to others. We caught up with him to ask some questions. Who is Ballymena First Aid (BFA) for? No-one knows when they will need first aid, so it’s for the whole community. Industry needs regulated first aid qualifications to remain compliant with health and safety regulations. Church groups, youth organisations and smaller businesses need designated individuals to be able to do first aid when the situation arises. Individuals, including young people, should also have a good practical knowledge of first aid in case it’s ever needed. Ballymena First Aid can provide all the necessary training for these group and individual situations. First Aid – delivered with care and compassion to those who need it. BFA can provide first aid cover at any event, private or public. They will work indoors or out, in any terrain, and provide first aid in a highly skilled manner. First Aid Training – designed to suit your needs either as single or multiple courses. BFA offer a huge selection of training courses with accredited qualifications including emergency first aid at work, paediatric first aid and more specialist courses, eg, forestry first aid. 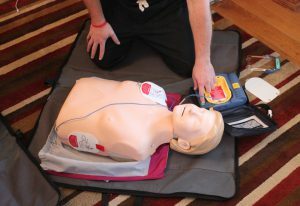 They also run several non-accredited courses, eg, basic life support. See the full list of training courses available here. 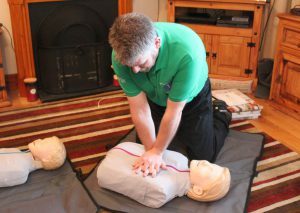 Ballymena First Aid training includes lots of ‘hands-on’ experience. For example, as you can see in the photos, it will cover CPR and the proper use of defibrillators. Danny is also flexible where the training takes place. Courses can be run in business or organisation premises, schools or wherever is convenient. Find out more on the Ballymena First Aid website here.